Ecommerce sector in India has been buzzing over past couple of years, especially due to sizeable VC money flowing into this sector. Companies like Flipkart are boasting of valuations upwards USD 1 Billion based on their recent funding rounds. However, nearly all these funded ecommerce companies are burning cash and none of them are profitable. They are burning VC money to gain new customers and market share. In this scenario, a niche Indian online marketplace – Craftsvilla.com, is showing that e-commerce is not about just burning cash. They are probably the only ecommerce company in India to turn profitable in less than 2 years from launch. Incorporated in 2011, Craftsvilla.com is a niche marketplace that sells Handmade, Vintage, Ethnic, Organic and Natural products from India. In Oct 2011, they raised undisclosed amount of seed funding from Nexus Venture Partners and Lightspeed Venture Partners. In 2 years time, this niche marketplace has turned profitable. They reported a PAT profitability of 1.2% on their 2nd quarter 2013 financial results. We spoke to Manoj Gupta, founder at Craftsvilla to understand more on how they turned profitable. What was your turnover for the 2nd quarter, where you achieved 1.2% PAT? We did close GMV (Gross merchandise volume) of close to Rs. 1.2 Cr in that quarter and we are growing at 10-15% month on month currently. We hope to clock overall GMV of 8-10 Cr this year (2013-2014) and targeting close to 25 Cr in next year (2014-2015). We plan to achieve 250-300 Cr GMV in next five years at PAT profitability of 18-20% which should give us healthy valuation of Rs. 1500-2000Cr in next five years. What is your marketing spend? How do you market Craftsvilla? We have 100% organic traffic which means we do not do any paid digital advertising. This gives us capital efficiency on the marketing front and therefore it has enabled us to become PAT profitable. We use mostly social media, blogs, traffic through search and affiliate channels. About 90% of our customers are women which enables us to do more focused PR marketing. Being a marketplace, how do you handle your logistics? Our logistics are handled by the sellers themselves and they are free to choose any courier of their choice as long as products are delivered on time and in right condition. We are an open marketplace unlike others which are more managed marketplaces. Our philosophy is that frictionless marketplaces, which are self serve platforms, would only be profitable in India. Managed marketplaces with centralized logistics and cumbersome seller on boarding processes are high touch which requires more manpower and therefore can never be profitable and sustainable in the long run. Craftsvilla focuses on ethnic and cultural stuff.. What is your procurement process for the same? We do not spend a dime on acquiring our sellers. Most of our sellers are women and are coming on Craftsvilla.com through word of mouth channels. We do not allow sellers who sell non-Indian and branded products like Nike shoes or nokia phones. We only allow sellers who are selling Indian theme products. There has been a lot of talk about how Indian ecommerce companies are just burning cash, with no profitability in sight. Looking at Craftsvilla.com, it looks like lean, mean, slow & steady growth with frugal marketing spend is the right way to go! Would love to hear readers’ input on this! 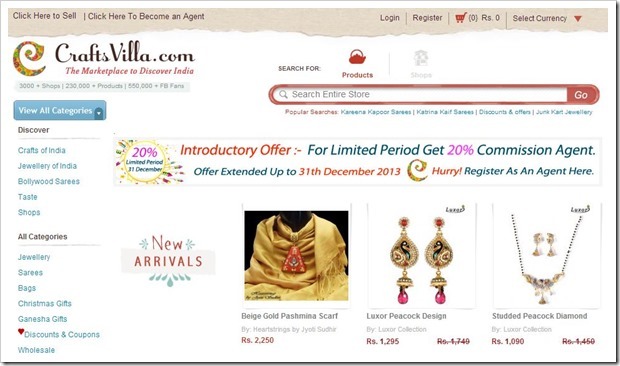 "CraftsVilla.com Becomes One Of The First Indian Ecommerce Companies To Turn Profitable! ", 5 out of 5 based on 1 ratings. Cash On Delivery: Should Indian Online Retailers Persist with it?